Salad days: Anne DesBrisay notes that Levante has a number of interesting salads on the menu, including this one that unites fennel shavings with spinach, grapes, and oranges. For my last “Pick” I told you about the Red Sea Café on beleaguered Holland Avenue — a worthy little place obscured from street view by fencing and heavy equipment and the other detritus of several months-worth of road-work. This week I’m taking us back to the barricades, to advocate for another restaurant taking it on the chin in the name of urban renewal. (Sorry, this restaurant is permanently closed.) opened amidst the eclectic mix of shops and services that lines Rideau Street east of Dalhousie, along with, since opening day in June, the construction crews that have this section of Rideau all ripped up. Over two visits, I’ve found pleasures worth enduring the dust and the noise. For one, the service has been immensely likeable. There was a young jazz guitarist that played for our one lonely table at a dinner here, and that was delightful. And the food’s been really very good. Smoked goodness: The kitchen keeps a smoker, which explains the goodness of the slow-cooked meats on the sandwiches and flatbreads. The kitchen keeps a smoker in the back alley, and it’s responsible for much of the flavour of the slow cooked meats that plump the sandwiches or top the flatbreads. Sliders are to be avoided in most restaurants — undersized bullets of something surrounded with too much bread — but not here. 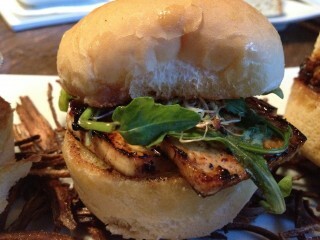 Delivered on housemade buns, I haven’t met one I didn’t like. 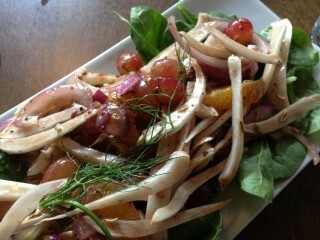 There are a few interesting salads on the menu – including one that unites fennel shavings, fronds and seeds, with spinach, grapes and oranges. The flatbreads are rustic pleasures, their toppings admirable, and a main dish of duck ticked every box. Desserts, particularly the panna cotta, are well worth investigating. 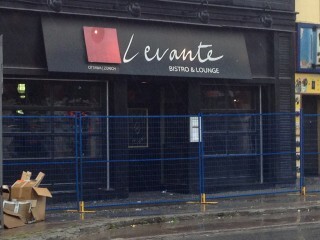 Anne DesBrisay notes that Levante is making a difference in this neighbourhood and exhorts diners to visit it during the construction period. Levante is making a difference in this neighbourhood, and it seems to be going largely unnoticed behind the barriers. I suggest you hop the fence and take it for a spin. Open: Monday to Wednesday, 4 p.m. – 10 p.m.; Thursday and Friday, from 11:30 a.m.; Saturday and Sunday from 4 p.m.
(Sorry, this restaurant is permanently closed. ), 180 Rideau St., 613-789-1821.